With statements from National Security Adviser John Bolton contradicting President Donald Trump creating more confusion about whether the U.S. is withdrawing its 2,000 troops from Syria, Secretary of State Mike Pompeo is heading to the Middle East for a whirlwind tour to reassure partners that the U.S. will remain a presence in the region. Trump declared in December that ISIS had been defeated and, "Our boys, our young women, our men -- they're all coming back, and they're coming back now." The Pentagon confirmed shortly after that it would be a total withdrawal, completed in 30 days. But after his surprise decision came under widespread criticism, the timeline for what the president had characterized as an immediate withdrawal has changed repeatedly. 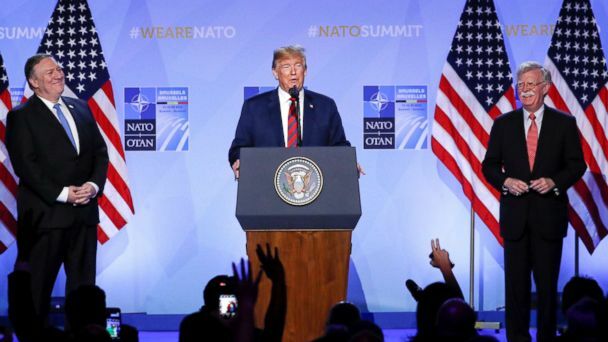 A week after the president's initial announcement, U.S. officials told ABC News that withdrawal would take several months, with no final decisions made about the planned pace. Last week, Pompeo seemed to lay out four conditions for a U.S. exit, telling conservative outlet Newsmax the U.S. would continue its military campaign against ISIS, keep the pressure on Iran, protect Kurdish partner forces from Turkey, and ensure the safety of religious minorities in Syria. The next day, senior State Department officials briefing reporters ahead of Pompeo's trip said there was "no timeline for our military forces to withdraw from Syria." Instead, the drawdown would be conducted "in a deliberate, heavily coordinated way with our allies and partners" in order to "maintain pressure on ISIS throughout, and [so] that we do not open up any vacuums for terrorists to exploit," one senior official said. Bolton, who traveled to Israel and Turkey over the weekend, repeated that idea alongside Israeli Prime Minister Benjamin Netanyahu, who reportedly opposed a U.S. withdrawal from Syria out of concern it would give Iran, an ally of Syrian dictator Bashar al-Assad, an opening to further threaten Israel from Syria. "There are objectives that we want to accomplish that condition the withdrawal," Bolton told reporters Sunday in Jerusalem, specifically the defeat of remaining ISIS fighters in Syria and protection for Kurdish forces that served as the ground forces for the U.S. and its Global Coalition to Defeat ISIS as it took on the terror group. While those Kurdish forces, known as the YPG and part of the larger Syrian Democratic Forces, were armed, trained, and advised by the U.S., America's NATO ally Turkey says they are terrorists for their ties to Kurdish separatists in Turkey, a group known as the PKK that Turkey and the U.S. have designated a terrorist organization. After Bolton's remarks, Trump appeared on board with a delayed departure of U.S. troops, telling reporters, "I never said that we are doing it that quickly ... We won't be finally pulled out until ISIS is gone." But when asked when troops will come home, Trump added, "It's going quickly." In the face of that confusion, Trump denied there was any contradiction on Monday, blasting a New York Times report as "very inaccurate" in a tweet: "No different from my original statements, we will be leaving at a proper pace while at the same time continuing to fight ISIS and doing all else that is prudent and necessary!" It's unclear what the president considers "prudent and necessary" -- and whether he agrees with the specific conditions Bolton and Pompeo laid out. But it will be Pompeo's task now to clear the muddy waters for America's partners, as he travels to Jordan, Egypt, Bahrain, the United Arab Emirates, Qatar, Saudi Arabia, Oman, and Kuwait for a week of meetings. The message is despite the Syria withdrawal and cuts to funds for stabilization in Syria, the U.S. is not pulling out of the region, U.S. officials said. "The United States is not leaving the Middle East," a senior State Department official told reporters Friday. "The Secretary will reinforce that commitment to the region and our partners." Instead, he'll seek to rally those countries to support the U.S. withdrawal from Syria by contributing more funding and possibly even troops. The State Department cut $200 million in funds for projects like de-mining, rubble removal, and restoration of services like running water and hospitals -- things that the U.S. previously said were critical to returning civilians to areas liberated from ISIS and prevent the terror group's return. In place of U.S. funds, Saudi Arabia, the United Arab Emirates, and other countries will give over $300 million to those same projects. With U.S. forces departing, there is renewed speculation that the Trump administration will be asking these partner countries to supply forces to patrol liberated areas -- something that a senior State Department official did not outright dismiss, saying Friday there are no plans right now, but, "We're exploring a variety of options." It's unclear how that would work, however, with Turkey and Assad and his allies Iran and Russia all likely opposed to such a move. Among the other topics Pompeo will have to address is bridging the divide between Gulf partners Saudi Arabia and UAE and their neighboring foe Qatar, as well as the murder of Washington Post columnist Jamal Khashoggi. Trump, Pompeo, and other top U.S. officials have denied that Crown Prince Mohammed bin Salman was involved in the royal insider turned dissident's killing, despite strong, repeated statements from Republicans and Democrats on Capitol Hill saying he was. Instead, the administration has defended the relationship with the Saudis, downplaying the murder plot as less important than stability in the kingdom. The Saudis began the first trials of the 15-men hit squad they have blamed for the murder, saying it was a rogue operation at the order of the deputy intelligence chief and an aide to the crown prince, who have been fired. While the administration has so far not disputed that account, a senior State Department official said the U.S. is still not satisfied. "I don't think from our point of view that the narrative emerging from the Saudis or the legal process is yet -- has yet hit that threshold of credibility and accountability," the official said, but added they will work with the Saudis "to pursue this as aggressively as they can to get this albatross off their backs and to get out from under the shadow of this incident." Pompeo may address some of those challenges in a major address while in Cairo this week about how the U.S. is "a force for good in the region," a senior official said.